I wanted to let everyone know about my experience with PCOS after pregnancy. In my case PCOS came back right away and with a vengeance! If I would have known this while pregnant I would have been more prepared and started treatment immediately. Immediately after having my child I noticed that my milk supply was not as high as it should be. I drank Mother’s Milk tea and took supplements but was not able to get a full milk supply. After doing some research I saw that this was common with women who had PCOS. About a week after the birth I started feeling crazy anxiety, I was nervous to go to the store, drive anywhere, etc. This is also common with post-par tum, but I did not have any other p-p symptoms. This was the start of my PCOS comeback. During the first 2 months after my son’s birth I lost 30 of the 50 pounds I had gained. But starting in month 3 I began gaining it back! I was eating healthy and walking, yet gaining about a pound a week. I regained almost all 30 pounds during the following year. During this year I was working out at least 3x a week, walking everyday and eating healthy at about 1200 calories a day. The weight gain starting in month 3 was attributed to PCOS. I was craving sugar like crazy starting about the 3 month mark as well, although I didn’t give in and really fought that craving. I also began experiencing pain in my ovaries, I went to my doctor almost every three months during my first year and a half post-par tum. They did ultrasounds and bloodwork, nothing crazy going on or giant cysts– just normal PCOS. 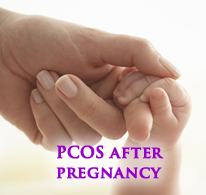 And the biggest PCOS after pregnancy symptom— no more fertility! I thought that I would be able to get pregnant again right away, well around 6 months post-par tum. But NO! We began trying at lil ones 6 month mark and still continue to try! Such a bummer. My friend who also suffers from PCOS went straight on birth control pills after her child’s birth. When they were ready to try for #2 she got off the BC pills and was pregnant the next month!!! Did anyone else experience PCOS after pregnancy symptoms? This entry was posted in PCOS, PCOS Infertility and tagged pcos after pregnancy, pcos post par tum.